When we are invited to parties I try to always show up with a dish in my hand. And usually that dish is an appetizer for the crowd. 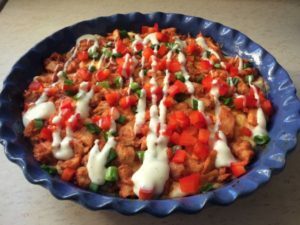 One of my favorite go-to appetizer recipes is for a BBQ Chicken Dip. It is super easy to make and super scrumptious to eat. This dip takes just a few minutes to put together, and it is always gobbled up within a short amount of time as well. There’s rarely any scraps left from this appetizer! For the chicken we always prefer it grilled, but you can cook it any way you’d like, or even pick up pre-cooked chicken from the store. 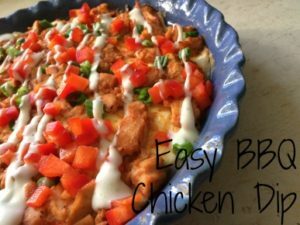 Plan to make BBQ Chicken Dip for your next party! Spread the softened cream cheese into the bottom of a pie plate. Mix the chopped chicken and BBQ sauce together and spread over the cream cheese. Bake at 350° for 15 minutes. Sprinkle peppers and green onions over the dip and then drizzle Ranch over the dish. Serve with cut up pieces of bagel or tortilla chips.